Outstanding sustainable architecture projects by the world’s most exciting architects. Architecture of Change 2 presents an unrivalled collection of the most innovative architecture that makes a considerable contribution to a sustainable future. Over forty exemplary projects by internationally renowned architecture practices such as Renzo Piano and OMA founder Rem Koolhaas are featured in addition to social initiatives such as Brad Pitt’s Make It Right Foundation. From a zero emission ice station facility in Antarctica to the High Line public promenade in New York, it represents a broad range of environmentally mindful concepts that are outstanding architectonically and also devoted to regional environmental and social conditions as well as their global impact. In today’s changing world, architects and engineers must address issues of sustainability when designing buildings, homes and urban developments. Through groundbreaking architecture, innovative urban planning and social engagement, the awareness of how sustainable architecture can make an environmental impact are becoming increasingly grounded in public consciousness. Like its successful predecessor, Architecture of Change 2 presents an unrivaled collection of the most innovative architecture projects that make a considerable contribution to a brighter future. Over forty exemplary projects by internationally renowned architecture practices such as Pritzker Architecture Prize winners Renzo Piano and OMA founder Rem Koolhaas are profiled with the newly built California Academy of Sciences and the master plan for a wind farm in the North Sea. The book also contains social initiatives including Brad Pitt’s Make It Right Foundation to rebuild the Lower Ninth Ward in New Orleans and theoretical research projects such as the “Political Equator” by Teddy Cruz, dealing with concepts of an increasing global border. From a zero emission ice station facility in Antarctica to the High Line public promenade in Manhattan, the book represents a broad range of environmentally mindful concepts that are not only outstanding in their architectural form but are also devoted to regional environmental and social conditions as well as their global impact. 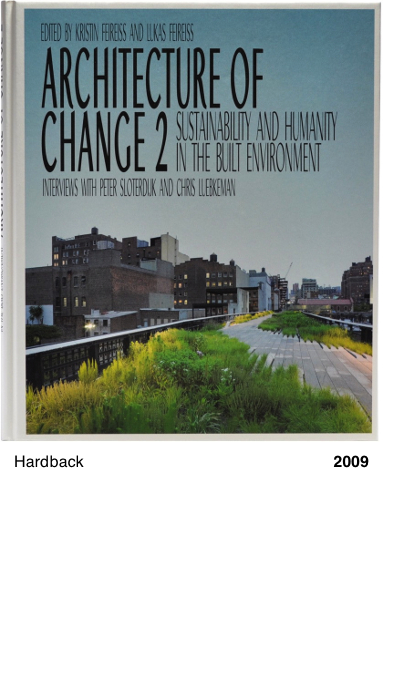 With each featured project fully illustrated through photographs and expounding texts, the book also includes interviews with notable experts in the field including German philosopher Peter Sloterdijk and visionary engineer Chris Luebkeman, making Architecture of Change 2 an essential reference for sustainable architecture and visionary urban development. It shows that creativity, science, technological innovation and social responsibility can genuinely improve our future environment.